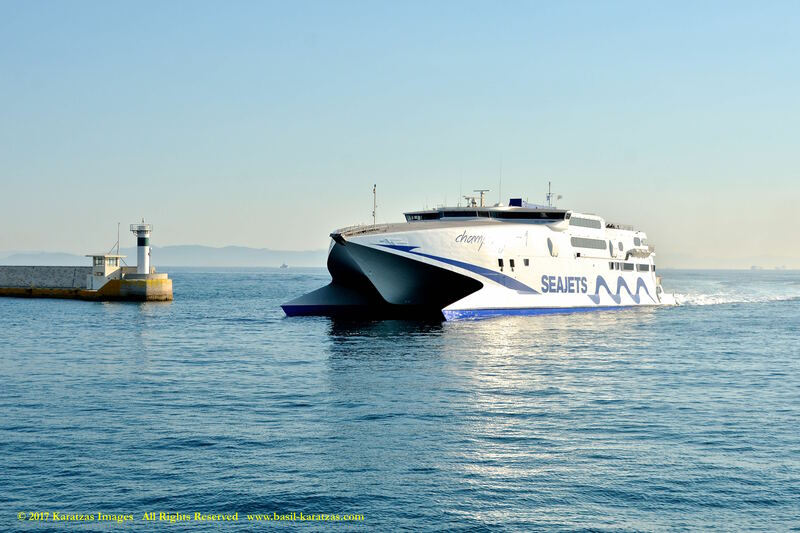 Posted on July 3, 2017 by Karatzas Marine Advisors & Co. 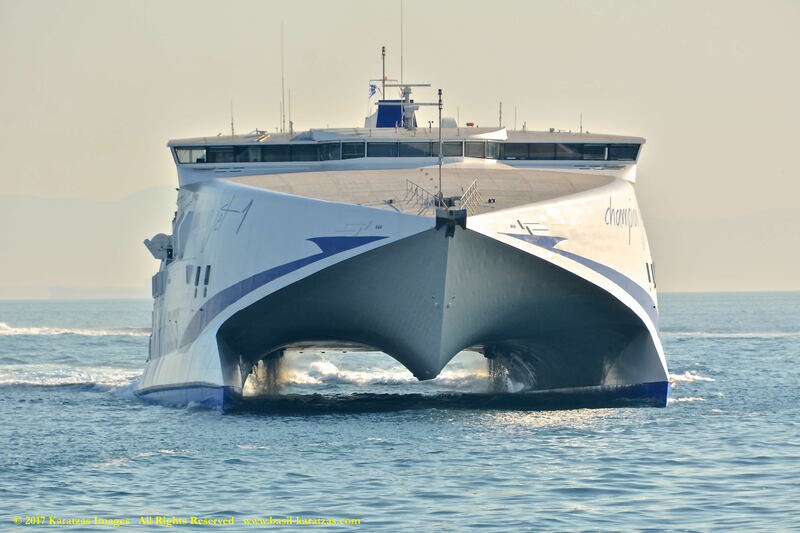 VESSEL IDENTIFICATION & DESCRIPTION: Ex-names are Condor Vitesse, Incat 044. Call Sign 5BFR4, IMO Number 9151008. 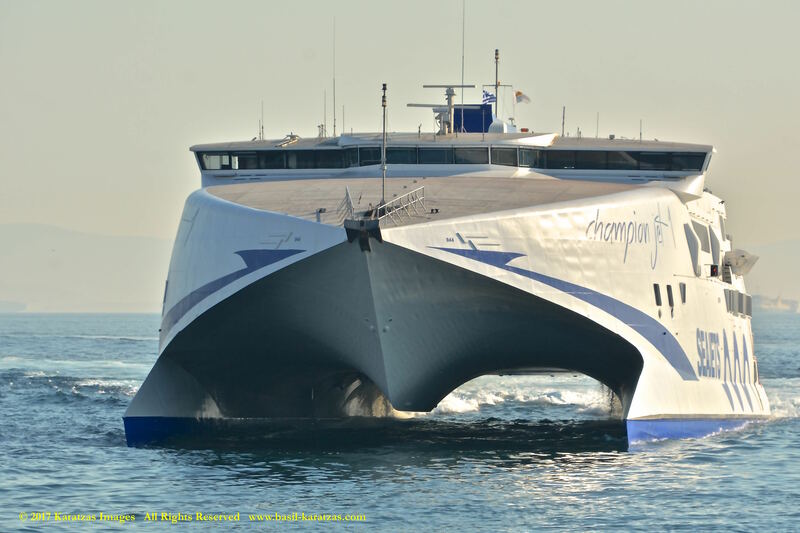 Built at Incat Tasmania, Cyprus Flagged, Length Overall of 86.00 m., Length Between Perpendiculars of 71.80 m., Draught of 3.60 m., Moulded Depth of 4.10 m., Beam of 26.00 m., Gross Tonnage of 5,007, Tonnage of 2,002 International Net and 344 Dwt (long). 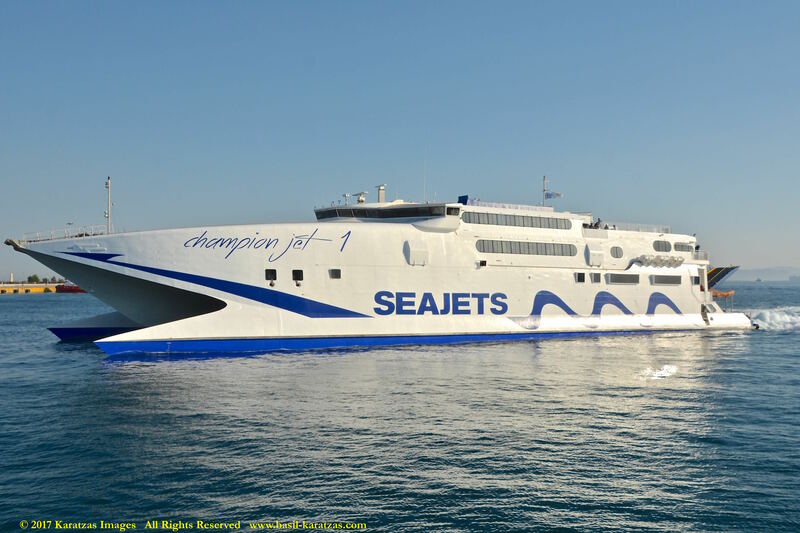 Additional info on the Vessel from Wikipedia at HSC Champion Jet 1. 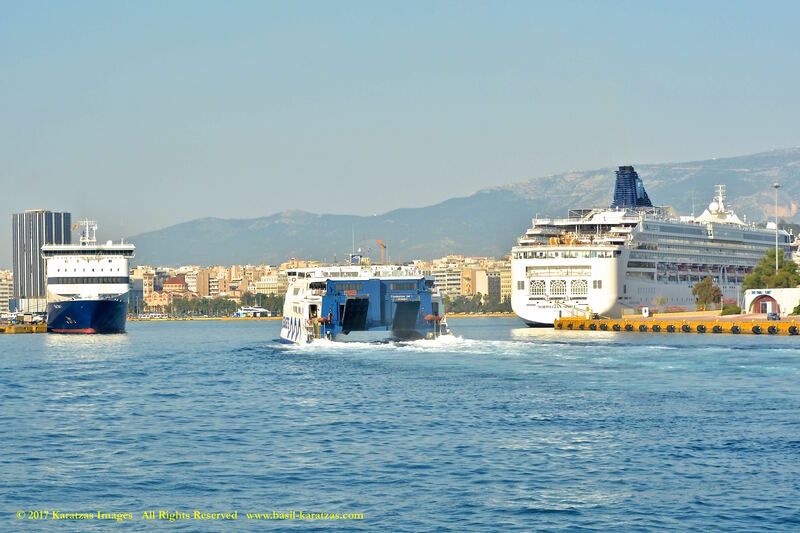 Vessel’s General Arrangement Plan can be accessed here. 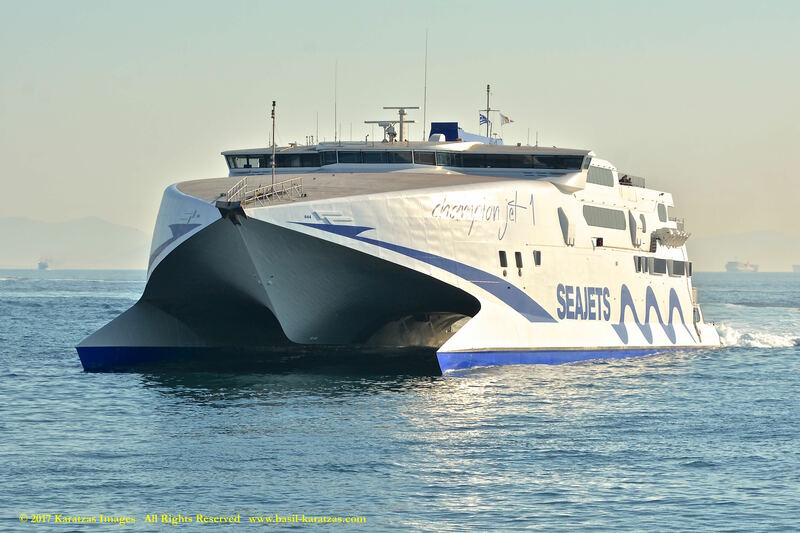 General Specification Sheet for 89 meter Incat Wave Piercing Catamaran can be found here. 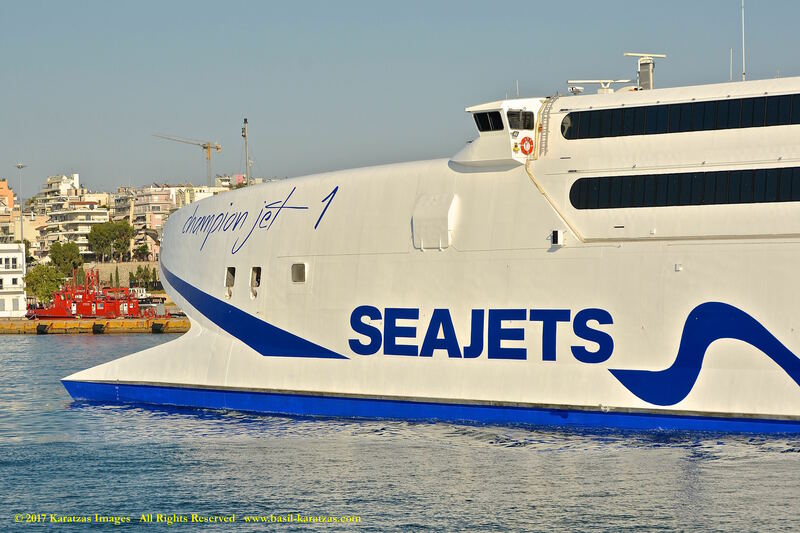 VESSEL OWNERS / MANAGERS DETAILS: Seajets Catamaran, Greece. Principal: Marios Iliopoulos. 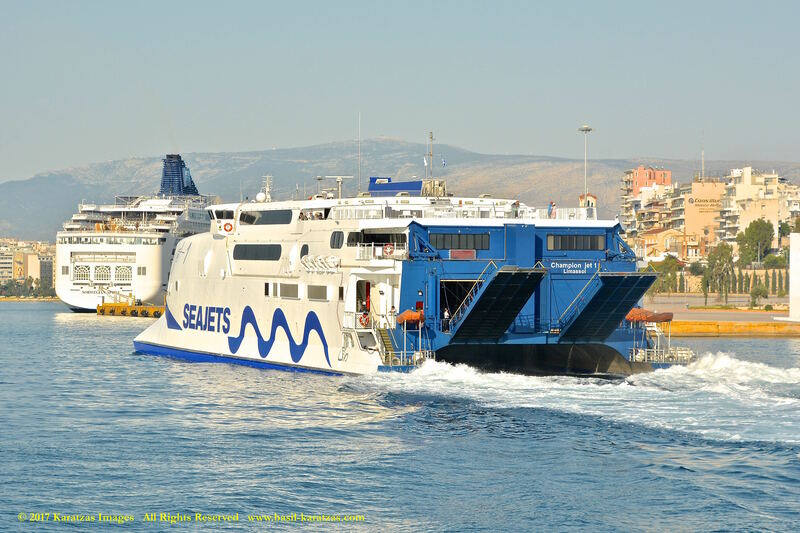 OTHER DETAILS: Vehicle Capacity of 200 Cars, 1 Stern(p) Ramp(s), 1 Stern(s) Ramp(s). 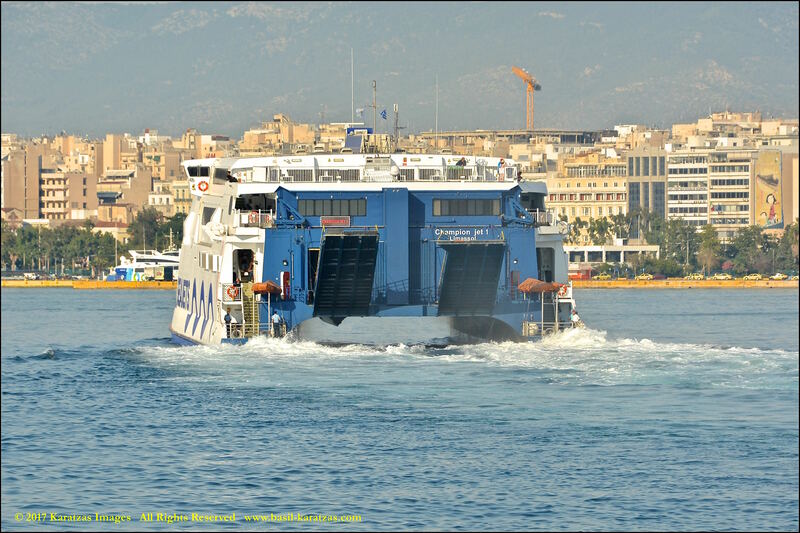 Total number of Passengers 800. MAIN ENGINE: 4 x Diesel – Ruston 20RK270 – 4-stroke 20-cyl. 270mm x305mm bore/stroke 28,302mkW total at 1,032rpm. Ruston Engine, Speed of 40.00 kts, Horsepower of 38,480. 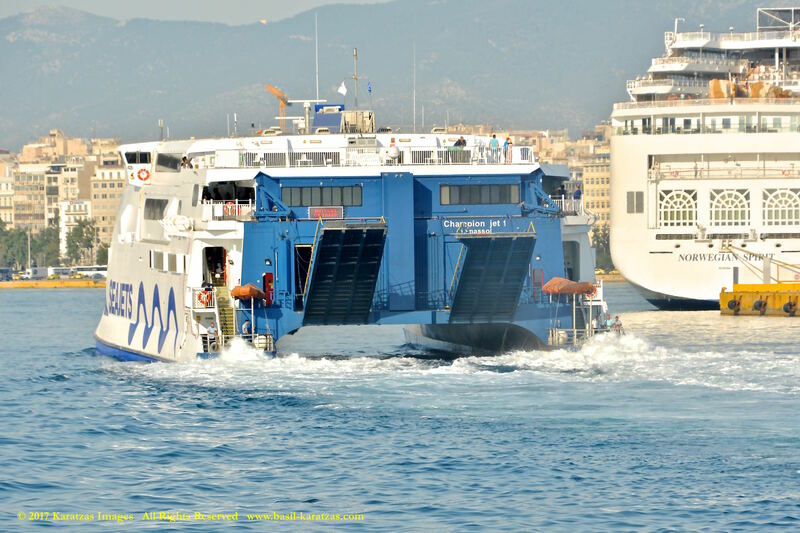 PROPULSION: 4 x Waterjet (Aft) (mechanical). 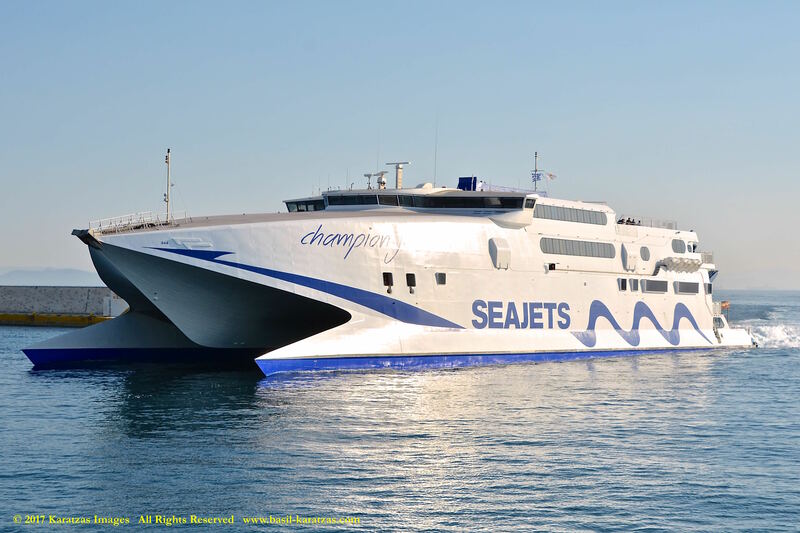 SALE & PURCHASE HISTORY: Reported sold to Clients of Seajets on 15 January 2015 as part of a enbloc sale. Newbuilding cost reported £ 23 million. Reportedly sold to her present owners in 2015 at €4.5 millions. 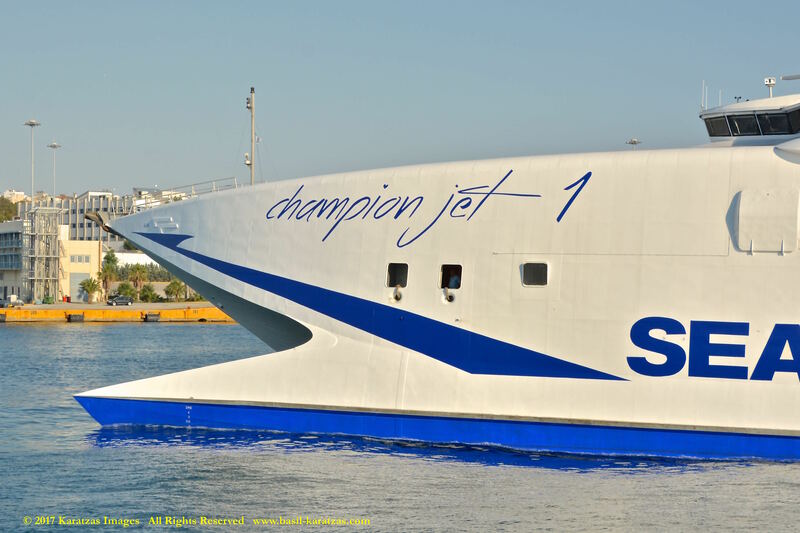 INTENDED TRADE: Daily departure from Port of Piraeus with Mykonos, Naxos, Santorini, with sistership vessel MS ‘Champion Jet 2’. 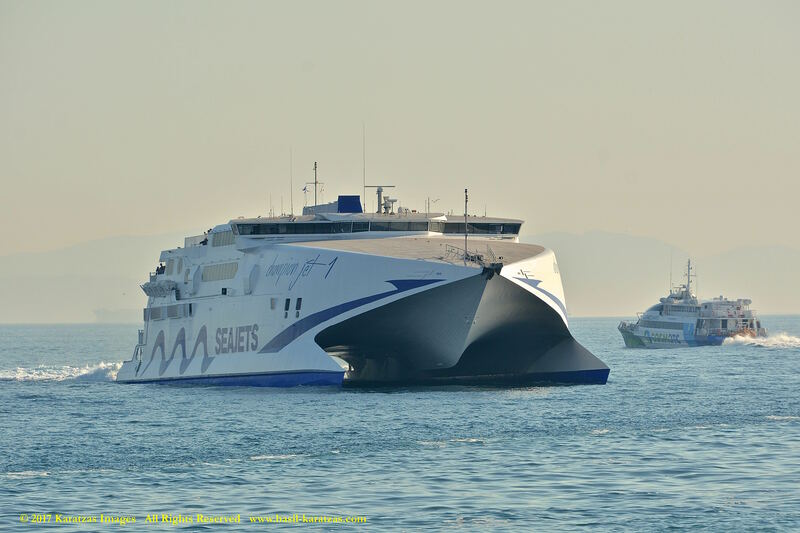 This entry was posted in Catamaran, Port of Piraeus and tagged Basil Karatzas, Brittany Ferries, Catamaran, Condor Ferries, Condor Vitesse, High speed craft, Incat 86, Incat Tasmania Pty Ltd., Karatzas Images, Karatzas Photographie, Marios Illiopoulos, Port of Piraeus, Ruston, Ruston & Hornsby, Seajets, waterjet, Wave piercing catamaran by Karatzas Marine Advisors & Co.. Bookmark the permalink.